Several years ago, my husband and I attended a diabetes education course sponsored by his healthcare plan. One gentleman in the class, who was in his 50s, had been recently diagnosed with type 2 diabetes. I was concerned about him, not so much because of his illness, but because of his wife’s anxieties about his care. Throughout the month-long course, she discussed activities that she no longer allowed him to do and the foods she refused to let him eat. To her husband’s dismay, she volunteered him to have his feet examined in front of the entire class. By the end of the course, the already-thin gentleman appeared to have lost weight. His face was gaunt, and his wife’s list of dos and don’ts continued to grow. This woman’s anxiety about caring for her husband with diabetes isn’t uncommon. Typically, spouses overreact to a new diabetes diagnosis out of love and fear that their husband or wife will lose a leg, their eyesight, or their life. They hear the horror stories, based on inaccurate information, about family and friends who have diabetes complications, and they fear the worst will happen to their loved one. Dietitians and CDEs who aren’t trained to manage such situations may lose control of the conversation during counseling sessions with couples. However, if RDs and CDEs take the reins early on and educate patients and their spouses about the disease, they can prevent them from making unnecessary behavioral and lifestyle changes, quell their fears, and help patients better manage the disease. More wives than husbands tend to overreact to a new diabetes diagnosis, mainly because women typically are the ones who buy the groceries and prepare family meals, explains Alison Massey, RD, CDE, a clinical dietitian at Mercy Medical Center in Baltimore. Massey believes the lack of knowledge about the disease was behind the wife’s behavior, causing her to fear for her husband’s future health. She may have been listening to family gossip or other misinformation. For example, family members may have blamed diabetes for Uncle John’s foot amputation instead of recognizing what really happened. Uncle John developed a foot infection but ignored it so his foot had to be amputated to prevent the infection from spreading to other areas of his body, Massey explains. So diabetes education is key not only for individuals but also for couples who are dealing with the disease together. • Explain the ground rules. Politely tell the spouse you need to direct your questions to your patient and that he or she must wait until all questions are answered before jumping into the discussion. • Excuse the spouse from the room. If the spouse interrupts, say, “If it’s OK with you, I’m going to talk with your spouse to get some information, and then we’ll bring you back into the room,” Massey says. • Divide and conquer. Some overbearing partners can disrupt diabetes education classes. On these rare occasions, ask the partners to sit in chairs against the wall of the conference room or on the outskirts of the conference table and focus your attention on the patients. Tell partners to ask all questions pertaining to specific circumstances after class or during individual sessions with their dietitian, says Gretchen Perea, MS, RD, CDE, of the Nutrition Wellness Center at Saddleback Memorial Medical Center in Laguna Hills, California. • Invite partner participation. Encourage partners to attend diabetes classes together, Sherr suggests. Not all partners do, she says, adding that they miss out on vital information, causing them to continue believing misperceptions and holding on to fears. • Refocus partners’ demands. Sherr says sometimes partners make impractical, definitive statements, such as, “You’re never going to eat this again” or “You’re going to eat broccoli.” Instead of confronting these types of remarks, ask patients what their favorite meals are and then offer suggestions on how they can prepare those meals with healthier ingredients. • Assign specific tasks. Among the biggest mistakes CDEs can make is leaving spouses on the sidelines, Sherr says. Suggest spouses help manage or administer medication, count carbs, calculate insulin dosages, plan meals, record daily blood sugar readings, and exercise with their loved one. • Discuss symptoms. Patients can forget to take their insulin and become cranky, Sherr says. Spouses often will pick up on this mood change before patients do. So discuss warning signs with patients and their spouses to help them feel more in control, less fearful, and capable of avoiding emergency situations. • Send them to school. Suggest patients and their spouses attend one diabetes education class before any private sessions. Perea believes these classes “quiet everybody down” since many of their fears and misconceptions typically disappear within the first hour of instruction. This enables dietitians to concentrate on personal matters specific to each patient during private sessions rather than correcting overprotective spouses. All these strategies highlight one important point: the need for education. By helping spouses better understand diabetes and nutrition, they’ll no longer walk around in fear but will be able to support their loved one in an informed and helpful manner. — Carol Patton is a freelance journalist in Las Vegas who covers health-related topics for various publications. Great Valley Publishing Company, Inc. Copyright © 2019. 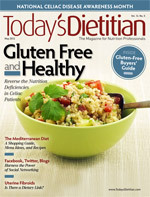 Publisher of Today's Dietitian. All rights reserved.